The bluffs of Dove Cay. The limestone dune cliffs of Dove Cay. Dove Cay is a small uninhabited rock cay near Cockburn Harbour on South Caicos. The cay is part of the Admiral Cockburn Land and Sea National Park. Dove Cay has a collective area of about 2.4 acres (1 hectare), and a maximum elevation of just under 30 feet (9m). Similar to the adjacent windward coasts on South Caicos and Long Cay, Dove Cay supports a terrain of semi-lithified soft limestone dune, limestone ironshore coastline, and low coastal vegetation. Like many of the boat day trip destinations in the Turks and Caicos, the attraction of Dove Cay is its simple beauty as a secluded tropical island, with turquoise ocean water and a pristine white sand beach. Another great feature of Dove Cay is a small sand bar beach that typically exists off the northern side of the island. This beach is a great landing point when accessing the cay by boat or kayak, and allows for easy access to the bluffs of the cay. Beautiful snorkelling also surrounds the Dove Cay. During typical weather conditions, it’s best to stay on the sheltered western side of the cay, yet the Columbus Passage eastern side of the cay can be amazing when the weather’s abnormally calm. 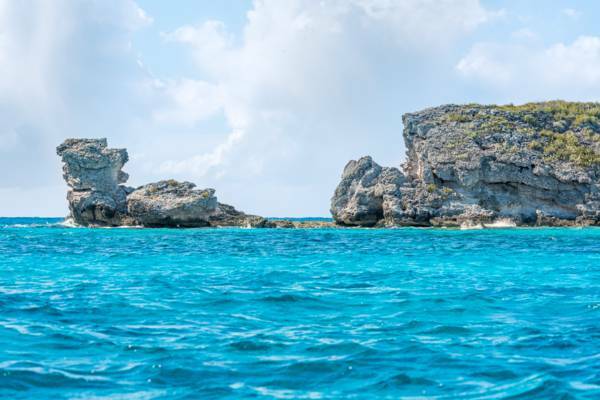 The waters on the eastern edge of the Caicos Archipelago are great for sighting larger sea life, including hammerhead sharks, stingrays, manta rays, eagle rays, turtles, reef sharks, and more. As Dove Cay is part of the Admiral Cockburn Land and Sea National Park, fishing and the taking of any natural or historical object is prohibited. The exquisite Long Cay is also found near South Caicos and adjacent to Dove Cay, and offers breath-taking turquoise ocean water, the critically-endangered Turks and Caicos Islands Rock Iguana, and incredible beaches. Huey, Dewey, Louie, three rocks off the eastern side of Dove Cay, are another sight and are an interesting snorkelling and shallow scuba dive spot. The quiet island of South Caicos doesn’t offer much in the way of organized tour and charter companies. Nearly every excursion operating from the island is a private and custom adventure, where the choice of the day’s stops are up to the guests. Dove Cay is only minutes from Cockburn Harbour by boat. At a distance of 700 feet (213m), Dove Cay is a little too far from South Caicos to be a feasible swim, particularly when there’s significant tide change. Due to the expanse of South Caicos and Long Cay, there can be accelerated tidal water movement in the channels on either side of Dove Cay in and out of the Caicos Banks. It’s possible to kayak or paddle board to Dove Cay, yet the availability of rentals and guided tours is limited at this time. Last reviewed by an editor on 13 December 2018.